M. Junius Silanus was one of the moneyers for the year 116-115 BC. He struck coins jointly with his colleagues for the year, Q. Curtius and Cn. Domitius Cn.f. Cn.n. Ahenobarbus, but is not otherwise known. Gens Junia was one of the most celebrated families in Rome. The gens may originally have been patrician. The family was already prominent in the last days of the Roman monarchy. Lucius Junius Brutus was the nephew of Lucius Tarquinius Superbus, the seventh and last King of Rome, and on the expulsion of Tarquin in 509 BC, he became one of the first consuls of the Roman Republic. Silanus appears to be a lengthened form of Silus, "snub-nosed", which occurs as a cognomen in the Sergia and Terentia gentes, and is not connected with the Greek name Silanus. In manuscripts the variants Syllanus and Sillanus are found. 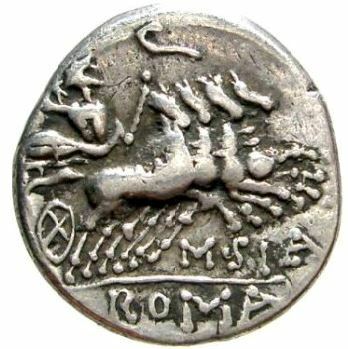 The Junii Silani first appear in history during the Second Punic War, and for the next four hundred years they occupied the highest offices of the state.